I am well aware in my last post that I didn’t even touch upon the whole point of my admission which was the octreotide trial. If you’ve read the last post you will understand why! My admission for the octreotide trial was planned, although the first admission date had been cancelled it went ahead the following week. My understanding of a “planned” admission is that all medications, tests, and the like have been ordered and are ready and waiting and that staff have been briefed about why you are being admitted and given a clear view of your medical condition so that you receive optimal care. Maybe my expectations are too high, I come from a retail background where daily we did things like handovers, planning and contingency plans. Everyone (99% of the time) was briefed, knew what role they had to play in the endeavour and someone was responsible and accountable for the plan being executed. If any part of the plan did not deliver, we would look at the root causes of what went wrong and ensure the same mistake didn’t happen again. Sometimes events happen that you could not have foreseen but this is how a business operates and to a large extent ( I am not saying the NHS should be carved up by private companies I am 110% against that) the NHS should be operating ( where it allows ) along these models. By not doing this it means its opening itself up as a target for those who want to do away with this magnificent organisation which is a tragedy. There does need to be serious reform, layers of management stripped away, investment in frontline staff and not the closing down of local emergency medicine units but what it needs the most is communication between staff / departments and between medical professionals and patients. Why is it people set so little store by communication? It amazes me, as communication is key within any organisation, the NHS even more so when failing to communicate can lead to serious mistakes costing lives. The first major obstacle when arriving on the ward was the staff, although having had access to my medical notes, clearly had very little understanding what severe autonomic dysfunction was or how it affects me. They talked about my condition in front of me but at no time actually asked me. All they perceived the problem to be was low blood pressure and an increased risk of falls, if only! This lead to the ridiculous situation where they insisted I was escorted to the toilet (which never happened, due to me making my own way there and back) and insisting that I was accompanied and watched whilst showering but that was the extent of my care. Yet at the same time when they made my bed the following morning they were quite happy to leave me standing whilst I waited for them to finish as they had placed all the clean linen on the chair. Leaving me the only option of sitting on my wheelchair, whose brakes had been left off when they had moved it, so I rolled back into the bedside cabinet. Face Palms! It was agreed that the octreotide trial would start the first evening of my stay. However the pharmacy seemed reluctant to give the medication to the ward. Despite being notified of my admission and being chased up from 3pm onwards the octreotide did not arrive until 18:45. My dinner had been served at 17:00 so I had to sit and watch it slowly congeal as the drug needed to be administered before I ate. I also had the domestic staff popping their heads in every ten minutes asking why I hadn’t eaten, “did I not like it?”and “did I want something else?” I can’t fault them for this approach, on a dementia ward it can be a battle to get some patients to eat. I was bloody starving having not eaten through nerves, so inside I was crying knowing that I would have to wait until the octreotide arrived. Congealing baked potato with baked beans and a yogurt warming to room temperature! Eventually I got my injection and a cheese sandwich was located for me. I have found a cheese sandwich is the safest option for a vegetarian when in hospital. (It probably doesn’t contain vegetarian cheese but I am not that strict when it comes to cheese etc). People still seem to struggle with the concept of vegetarianism. Once when admitted on another “planned” admission I was given a baked potato with Tuna and mayonnaise as the vegetarian meal. 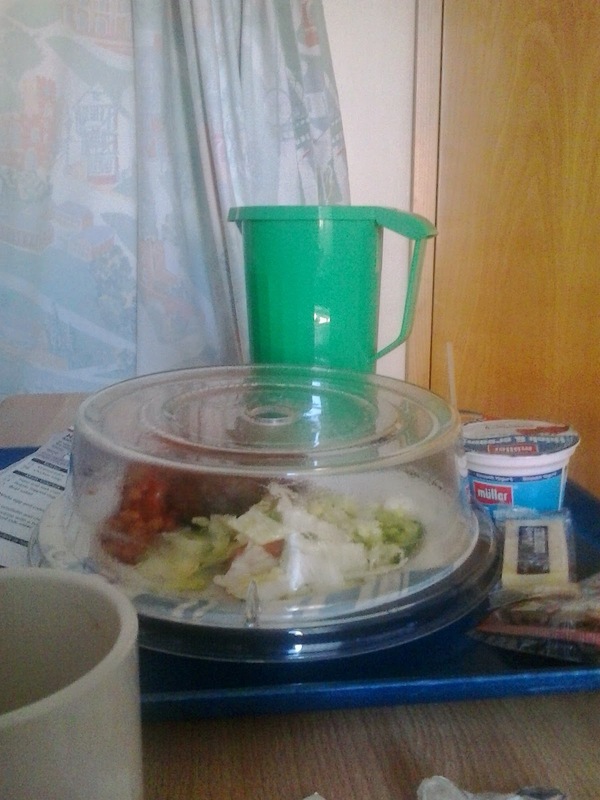 The nurse was quite miffed when I pointed out this wasn’t a vegetarian meal. She hastily scrapped the tuna off my baked potato and handed it back to me. I managed to piss her off again when I said that I wanted something else, opting for a cheese sandwich that was prepacked and had no meat surreptitiously scraped off it. Eating off the hospital menu is much safer as it accommodates for all, however arrive in the afternoon when the person who vacated your bed prior to your arrival, has ordered from that days menu and that’s what turns up as your evening meal, vegetarian or not! I still had a small postprandial episode, I was expecting as much due to not having eaten all day. Plus a sandwich is pure carbohydrate and that makes it much worse although with me any food group will do it. I did notice that although I ended up falling asleep for 20 minutes I didn’t wake up as confused (for some reason though I woke up and thought I was back in my bedroom at my parents house, where I haven’t lived since 1996!) and the tachycardia that preceded my doze wasn’t as forceful. This was exciting stuff as it meant the drug was working. I did have a small amount of gall bladder pain and a bit of bloating but it was minimal. My octreotide was being used in an off label way to treat postprandial hypotension by stopping the blood pooling in my abdomen. The staff were familiar with the drug having issued it to patients before just never in this context which became abundantly clear the following morning. At 6am I was awoken by the nurse that I had argued with about pain relief and bedsores. She was brandishing a hypodermic needle and telling me it was time for my octreotide injection. Having been in hospital more times than I care to remember, I knew that breakfast would not be served until at the earliest 8am. The injection was supposed to be administered 20-30 minutes before food. So we had a problem. I asked quite casually if breakfast was coming shortly and was informed no. I pointed out the injection had to be done shortly prior to food, I was informed breakfast would be in the next few hours and was that ok? The obvious answer was no. I have to give credit here to the nurse, although we clearly didn’t get along, she suggested she got me some toast and a cup of coffee and then she would do my injection. Disaster averted. In my notes the time given for my injection was 6am, which had been written up by either a doctor who hadn’t seen me, doctor nice but useless or someone who had forgotten the purpose of my stay. Another error of communication, or staff ignoring the instructions of others. This was starting to grate on me that my case wasn’t being handled properly. It was only the fact that I was alert enough and strong enough to advocate my own care that this injection was not administered without food. Which I now know through accidentally forgetting to eat after giving myself an injection would have sent me into a full on hypoglycemic attack. Injection administered I happily ate my toast and slurped my coffee. I noticed that after my injections I was getting a strange headache in the base of my skull and a strange feeling in my tongue accompanied by a metallic taste. I hadn’t had the horrific reaction I had feared which is usually projectile vomiting and profuse diarrhoea. Hence why I had packed numerous pairs of underwear and pajama bottoms! My consultant popped his head around the door at around 9am, I had a frank discussion with him about the fact that staff were trying to give me the octreotide injections without food and that my pain wasn’t being managed. He told me that he thought that I would be better off at home where I could look after myself, administer my own pain medications etc and that he would keep me on the same dose that I was recieving now. As we were coming up to the Easter bank holiday he also gave me his own private mobile (cell) phone number to contact him If I had any problems. A&E or an emergency doctor, which would be the only healthcare accessible over the bank holiday weekend would be unable to deal with my case. Far better should things go pear shaped over the weekend that I should be able to contact him directly. I was touched by this gesture, some people may say its just good doctoring and whilst yes it is, this level of care or compassion had never been shown to me before in a hospital setting. With most hospital doctors I have found its a case of out of sight out of mind. Dr B would surprise me again in a few days time. I would only be allowed to go home on that day, if I had been shown how to inject the octreotide. I was told that a nurse would come and show me how to do the injections and would make sure I was happy with it before I would be discharged. That was the theory, in practice the only words to describe it adequately are piss poor. 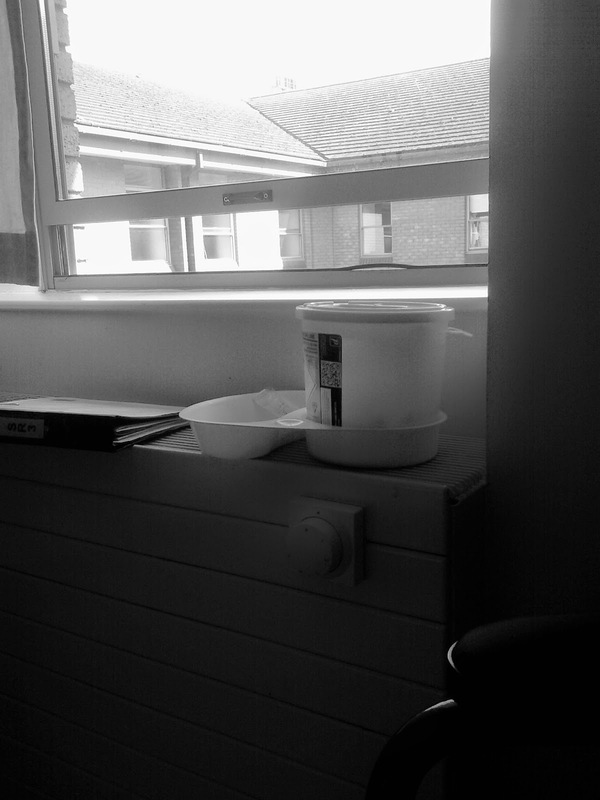 An arty shot of the injection kit left in my room because you guessed it lunch wasn’t coming! An hour elapsed before lunch arrived and no sooner had my plate been set down my nurse arrived to “teach” me how to inject. I have put the word in teach in inverted commas as it was a joke. No diabetic patient who injects multiple times daily would have left hospital with such a brief teaching session on injecting themselves. I was handed a syringe asked to load a certain amount into it and check for air bubbles. All of which I did ok. I was then told to pick a spot on my stomach, pinch the skin and inject myself with the diamond shaped side of the needle pointing upwards and push the plunger down. Again I did all of this ok however I wasn’t told to release the pinched skin and count to three and then remove the needle. I removed it with the skin still pinched so a large amount of what I had injected oozed back out again. That was it, that was my teaching session on injecting myself. No oranges to practice on, no question and answer session, the nurse just packed everything up and left the room. Injecting myself was no big deal but once I left hospital I actually learnt more from asking questions on facebook than I was ever taught in hospital which shouldn’t have happened. I found out that the gastrointestinal symptoms are much less if you leave having food until 40 minutes after the injection. I also learnt that octreotide injections can be drawn up and stored at room temperature for two weeks which means the injections sting less. In hospital one dose was taken from each octreotide vial and then it was thrown away. This meant 75% of an expensive medication was simply tossed into a sharps bin, thats criminal! I get three doses out of one vial, I lose 25% of the meds due to it being drawn up through one needle and then I change needles to carry out the injection but I am not throwing away 75%. This stuff doesn’t have to be kept in a fridge if being used in the next two weeks. So only one vial of the medication needed to be used during my stay instead of three. I know that this drug in Australia costs thousands of dollars a month to be on. Its expensive stuff, to not load other syringes up with it when you open the vial seems lazy and not cost effective. When I discussed this with my gp over the phone I could literally hear him rolling his eyes! When the NHS and the country is in a period of austerity why was this drug being thrown away? I could have been sent home with the preloaded syringes. They wouldn’t have gone to waste. I managed to get home that night after a lengthy wait for the pharmacy to get the octreotide dispensed. The nurse in charge of my medications on discharge was the most miserable person I have ever had to deal with and I’ve met lots of miserable people over the years! She didn’t crack a smile once and answered any questions with as few words as possible. 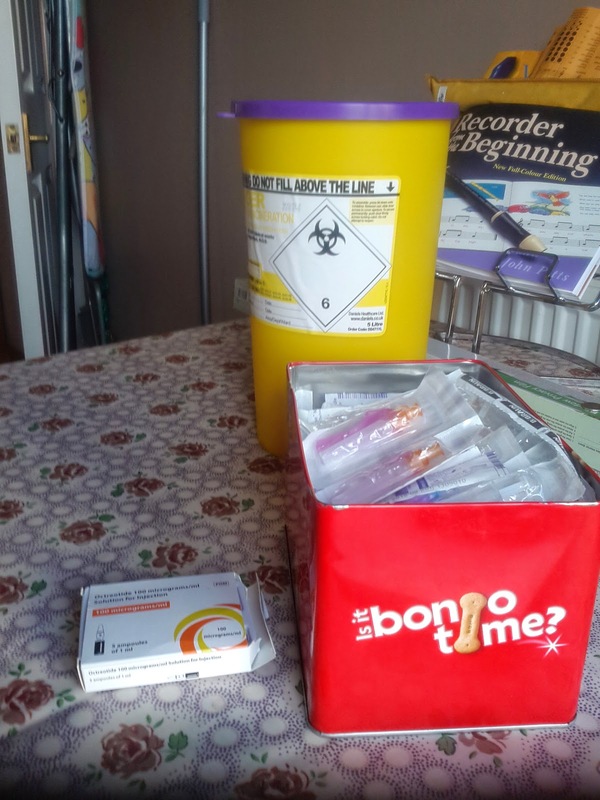 When I asked for a sharps bin to dispose of my used needles at home you would have thought I had asked for a bar of gold bullion. I had to remind her constantly to get my opiates out of the wards controlled drugs cupboard and also my steroids from the fridge. I couldn’t wait to escape, just as we were about to leave a healthcare assistant that I have got to know over the last few years as she helps at Dr B’s clinic popped her head in to say hello. I was greeted with the usual hug and kiss from her which I could see from nurse ratchets expression did not go down well! After a brief chat with S, the lovely HCA we made a break for it, narrowly avoiding being crushed by the doors on the way out. At home injecting was fine if a little nerve wracking. The first day I did it without my husband in the house my hands shook! Having heard how nervous I was he suggested that I draw 3 doses worth of octreotide up at one time and store them ready for injecting. That way I wasn’t putting pressure on myself to load up the syringes and then inject. A very sensible idea which has helped me loads! In hospital I had been having two doses of octreotide a day so I continued with this. By the Sunday I had become very cocky and upped this dose to three, big mistake! I was up all night being hideously ill.
On the Monday ( Easter Monday) at 930am aprox my Consultant rang completely out of the blue, to check how I was. I told him things had gone ok until I upped it to three times a day. He told me not to inject that day and start again on the Tuesday at one injection a day. I am still all these months later stuck at one injection a day as I can not tolerate anymore than that, which is a shame as it works so well. Presently due to the bouts of cellulitis, I have stopped my injections as the antibiotics I am on really mess up my innards. I am also loath to give myself an open wound every day when the cause for my two bouts of cellulitis in a month is unknown. Once I have stopped the antibiotics and been free from infection for a few days I will start them up again. Without them the postprandial hypotension has been a nightmare. My kit including the worlds smallest sharps bin (sarcasm alert!). And yes thats a dog biscuit tin that I am storing my needles and syringes in! Oh good gracious what a mess all the way around! It appears communication dors breakdown in many Healthcare facilities. If we aren’t our own advocates wr are in trouble. I hope you are doing better now. Yes and I haven’t really written about everything that happened! Its a bit scary when its a planned admission, what the hell would happen in an emergency! Sadly what the hell would happen is right. I had a Baclofen Pump implanted 3 weeks ago and it was my first time having a procedure in this particular hospital. Leading up to the surgery was rather unnerving with the communication. Once I got there the nurse I had was so out of it I won’t go in to the list. Fortunately the Anesthesiologist came in because she was so knowledable. My Dr came in shortly after. Luckily or I might have changed my mind. Thank goodness 1/2 the people were wonderful. I still think your stay unfortunately takes the cake. Its so sad that so many people aren’t being looked after properly or feel that the staff they deal with are unprofessional / unknowlegeable. I always used to accept it if things weren’t great but I no longer do. By not communicating or taking the time to speak to a patient you are putting them at risk. It takes a strong person to speak up for themselves when things don’t go to plan but as I have got older I’ve found the courage to advocate for myself. This wasn’t even close to my worst hospital stay! Thank goodness your doctors made you feel comfortable and were knowledgeable! I would have been like you absconding from the hospital if they hadn’t of been! I hope your Baclofen pump is working well.